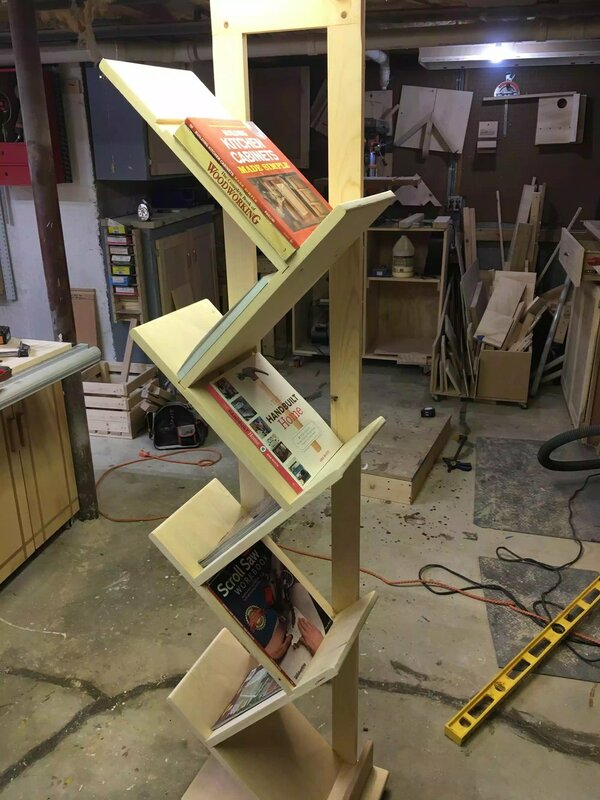 The book stand is all finished and it looks awesome. Like I stated before I am not the best at applying stain to projects especially this type of projects because it is two tones, what I mean by that is some parts of the unit are not stained at all and so I needed to cover them sections with painters tape while applying the stain and to be honest it didn't do that great a job because I had some bleeding through the tape . I will show pictures below. Here you can see another example of the staining bleeding through the tape, I decided to stain the whole of the base as it looks so much better. As you can see the stain lines are not very crisp, I needed to clean this up. I cleaned It up a lot but in the future I will be staying away from staining like this, especially with pine because it is famous for blotchiness. Here is the base all stained and it looks so much better, I didn't stain the oak book stop and I think it adds to the project. Here you can faintly see the wood grain through the stain and poly, the grain is more dominant to the naked eye, my camera isn't really picking it up. I really love the shape of the unit. Back view of the stand, this looks very good, I almost wish I hadnt stained the project because I love seeing the woodgrain and the joinery wood plugs, but hey its ok to color a project especially since it was on my honey do list. Here I added some books just to display how they look on the unit. 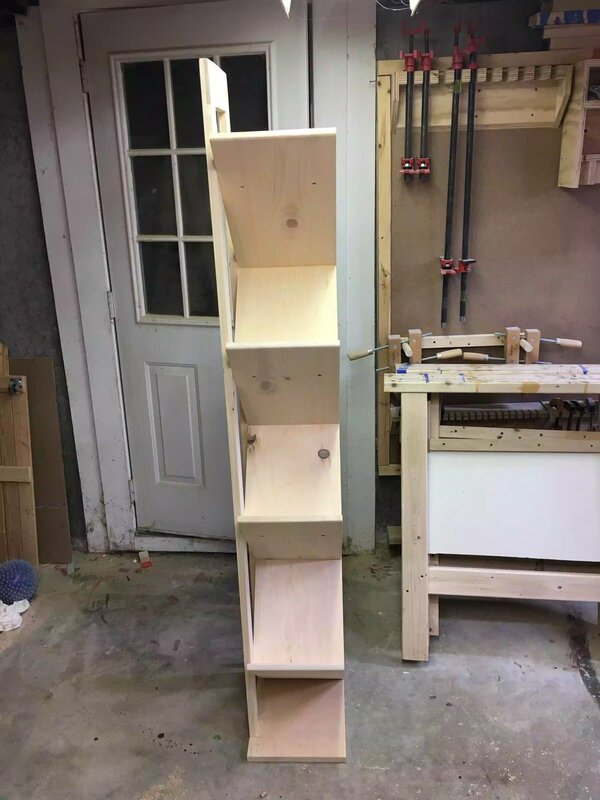 To be honest if my wife doesn't like this unit I might just keep it for myself I have amassed a lot fo woodworking books over the years and I could use storage. So that's a wrap, if you would like to purchase plans for this project, you can find a link below. Using a oil based wood stain. So I check with the boss and and agreed with me that chalk paint was not suitable for this project mainly because I wanted the grain to show through whatever color we put on it and she she agreed with me, So I purchased Varathanes Weathered Gray. We also agreed that we would not stain the entire stand so as to leave it two toned, so in the end we left the back legs & base unfinished and stained the shelving portions of the stand. I brought the unit upstairs to the home office and put it in the location that it will stay. Brought the unit back downstairs, and started using painters tape to cover the parts of the unit that were not to be stained. Finally today I stained the unit. 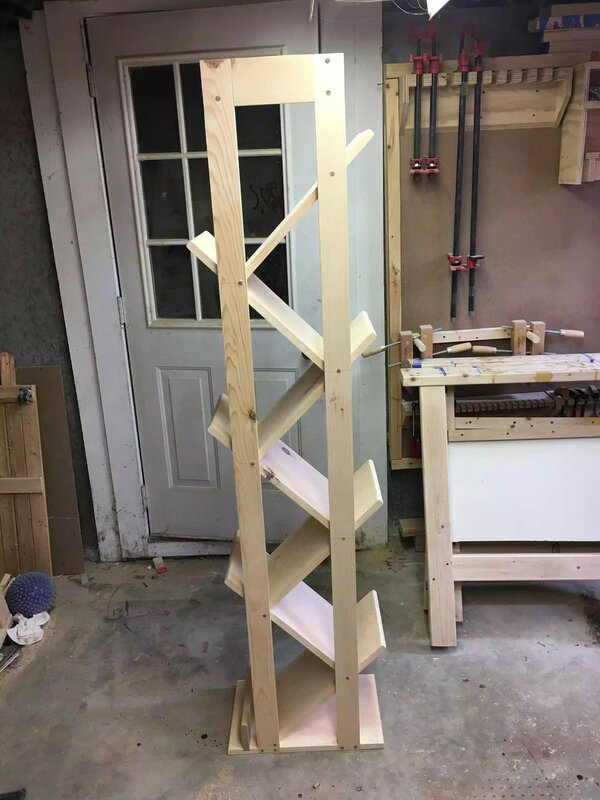 I needed to visually see the book stand in its intended home so I brought it upstairs and my wife was very happy with the design and she didn't think it was going to be that big, size is a factor in the home office because there are still projects to be made and we need to make sure that we have enough room. Here is the unit in its location in the home office, now I can get to finishing. In order to achieve the 2 toned look on the project and that my painting and staining skills are not great, I used painters tape to section off the areas of the book stand that I didn't want stain on. It took me a long time getting the painters tape on because there are so many angles and areas that are awkward to get to. The back right leg all taped up, I used alot of tape for this process. Starting on the base, its all taped up. All taped up and getting ready for the stain, I thought the best position to apply the stain was in the vertical position, that way I could get to all parts of the shelves and pooling would be at a minimum between the shelf ends. Here is the unit on its side and I have taped up both legs, almost done and ready for stain. Not a bad job, but time will tell. I'd better not see one drop of stain on the taped areas. So now we are ready to stain the last 2 hours have been building upto this part of the project, sometimes I am nervous because I am not the worlds best finisher and I hope the color is nice, I did do a few test pieces to make sure the color on the can matches the actual stain because sometimes in the past it doesn't especially wood colors, like oak or walnut, but this is gray so it should be OK. The pictures below are after I just stained it and I left the project for a couple of hours to dry and checked it again later, the stain said that it would dry in about an hour but because I work in a basement my drying times tend to me alot longer. But before I closed the shop up for the day I checked it and it was bone dry. I also need to apply an oil base polyurethane so as that I protect the parts that are not stained and also so as that I can clean the project when it gets dusty. Finaly need to bring it upstairs and attach it to the wall, I have 2 crazy kids that are sure to be messing around it. So today was a short day in the shop and didnt get much done, but I did assemble the bracket feet, made the cove molding and assembled the whole bracket feet assembly to the unit. So the feet and frame were all glued up from yesterday so I just used a combination of hand sanding and also used my orbital sander to clean up all the squeeze out and they came out awesome I was hoping that the design wasn't too elaborate for the unit because after all it is a minimalist style project. Here is another view of the feet , not cleaned up yet. Here is the finished bracket feet , all sanded, I just love how the grain wraps around the feet. Here is the mitered frame I made using biscuit joints, the bracket feet are attached to the bottom of this frame. To figure out how much cove molding I needed to make I used my shop made offset guide block to draw a 1/4" line on the front and sides, since I wasnt applying molding to the back as it will be against a wall I didnt place a line back there. Here you can see the 3 offsets on the block , I used my dado stack on the tablesaw to make this. My offsets are standards at 1/4",3/8" & 3/4". I was in my local Home Depot looking at finishes for this project , could decide on one yet, but since I was there I went to the mill work dept and looked at buying some cove molding for project and their prices were outrageous, so I made some myself using my router and a cove molding router bit that I forgot I had. After doing a little research online and watching videos on YouTube I was pretty sure I could pull this off, so I used an oversize blank of scrap wood that I had, brought it to the router table with the cove bit installed and ran it through the blade, after that was done I brought the blank to my table-saw to rip the profile off and that is it . I used some sanding paper to clean off the milling marks left from the router and hey presto I had my piece of molding ready for my project. 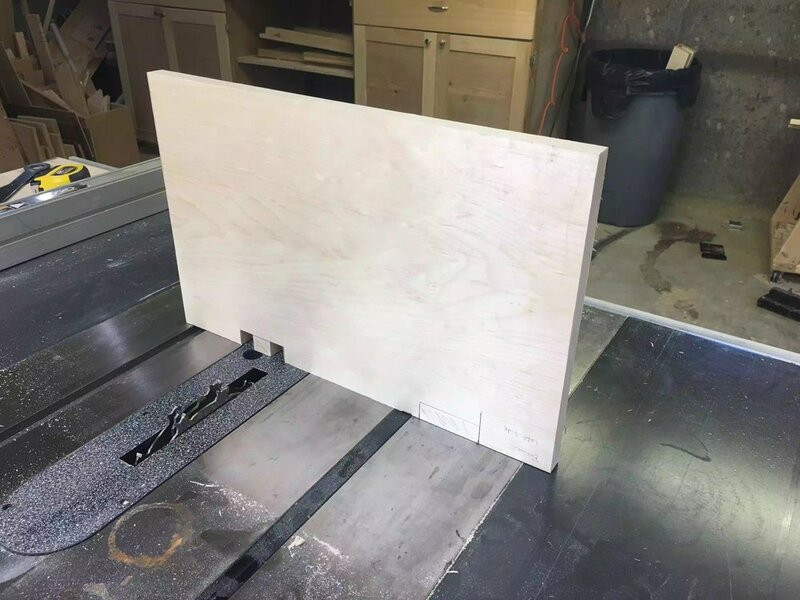 Here is my router table and the blank I used. Using my Grripper and the table-saw I ripped the molding off. Since all my parts were milled it was onto the next step off adding all the parts to the shelving unit base, so I started with adding the mitered frame onto the base of the unit, this was not very hard and it didn't need to look pretty either, but the frame did need to be positioned correctly because I made the frame oversized because I was adding the cove molding and I need a surface to glue and brad nail it to. A good look at the frame, its basically a big picture frame. 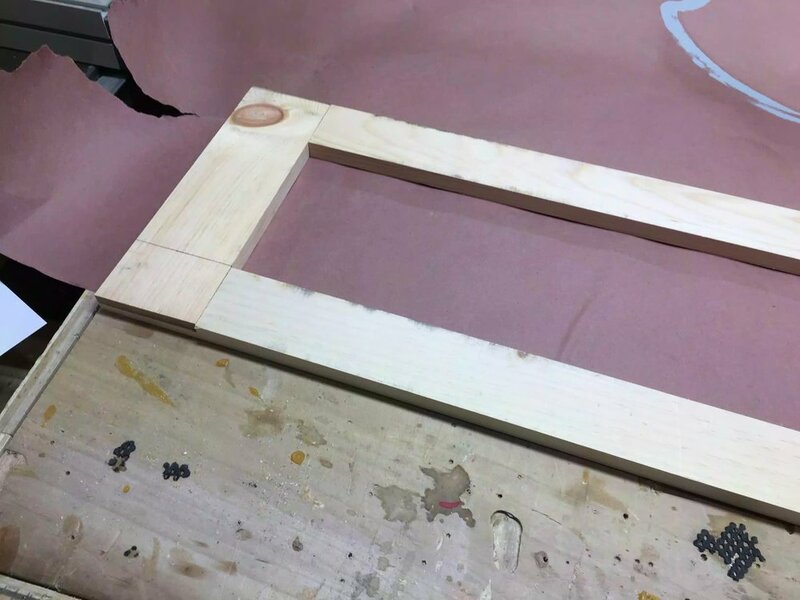 Here is the mitered frame attached to the base , I used 1 1/4" drywall screws to attach it, and that's it, making sure the frame was flush to the back and that the over hang on the front and the sides matched the thickness of the molding I made. The bracket feet will be attached to the base with glue and mounting holes that I drilled using a forstner bit on my drill press, I also used little clamps to keep the feet attached while I hand screw the feet into position, I didn't want to use a impact driver for fear of blowing the out the feet and all my hard work down the drain. 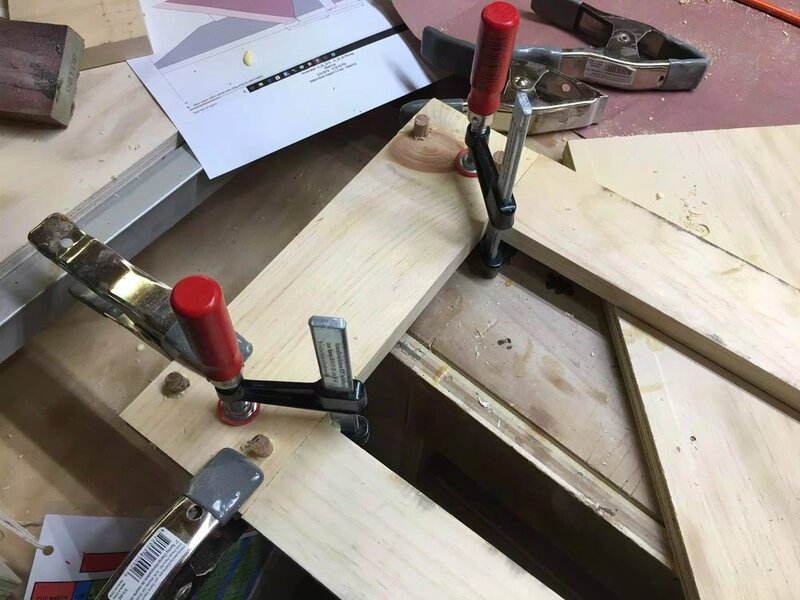 Here you can see me attching one of the feet on the frame, I used an F style clamp to keep the foot in position while I hand screw the foot on, I also added glue to the top of the foot. So with the feet attached and the entire unit a lot more stable I moved onto installing the cove molding that I made, I made sure I made enough to have errors in cutting the coves mitered ends, I really needed all the angles to line up going down the corners of the base otherwise it would look terrible. Here is a close-up of the cove molding, need to clean up the brad pin marks and then sand it all down. Here is the front of the base, not too bad. So that is it for today this last part fininished the build phase of the project. Tomorrow I will be onto the finishing touches, such as sanding , using some wood filler to cover the pin holes on the molding. I still need to figure out a finish on this, I might use some paint but I got to check with the boss as to what she wants, since she is the painter in the family, until then. So yesterday I was looking at the project and new that I wasnt finished I had to do a little more to finish the construction work on the unit and I also needed to find a way to add some stability to the unit and thats when it hit me. In a moment of inspiration I realised that I needed to add bracket feet and a frame to the underside of the base. But I will get into that a little later. Since I completed all the shelves other than this one I made quick work of it, I left the final shelf because I wasnt sure of the exact length of the shelf so I measured the approx length of the shelf and put it into the dado I could for it and struck a line across the back edge abd since I wanted the top of that shelf flush with the top of the back legs I took it to the tablesaw and cut the 45 degree bevel into it. I glued and screwed it into place through the back side of the dado as usual Below you can see the picture of top shelf. 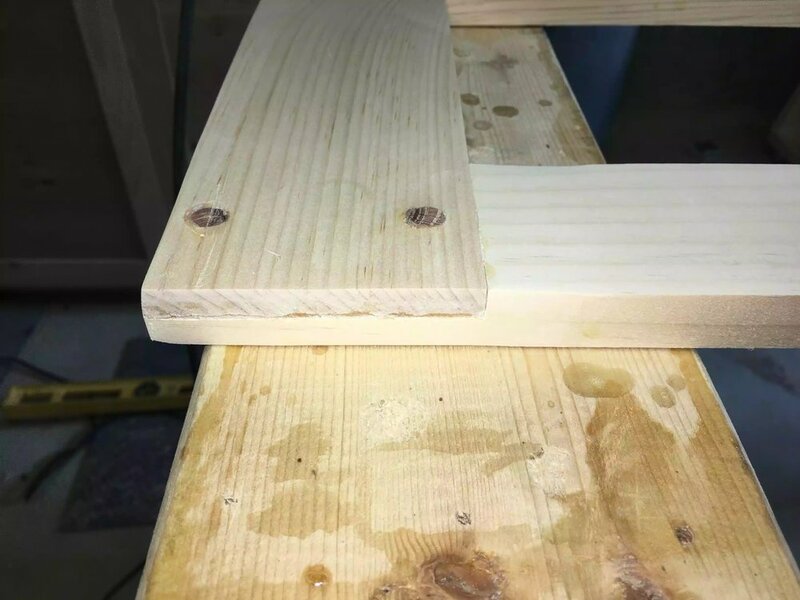 I didn't want all the screw holes showing on the undersides of the shelves and also anywhere that was visible so I usually counter-sunk the holes and add wooden plugs like below, I have used varous method of using plugs sometimes I make my own using a plug cutter in my drill press or buy them in bulk. Sometimes I use the same colored wood but most of the time I use a contrasting wood to highlight the joinery method it looks like a old fashioned dowel was used. Here you can see the oak plugs I just need to sand them smooth or use my flush cutting saw to trim them. Here is an example of a plug cutter. Here is another shot of the plugs I really think it adds a nice touch to an otherwise ugly alternative to leaving the hole. So the other day I received a woodworking magazine that explained how to make bracket feet, it went into alot of detail on where they came from and what they can be used for nd it struck me that I adopt this nto my shelving unit. So I went to Sketchup to draw out a model to see what it will look like in 3D and I have to say it will look very nice, I didn't make them as big as the ones you see on big pieces of period furniture but they do add a elegance to the bottom of the shelving unit. So after Sketchup I printed what I made and took them to my shop and I had enough scrap lumber to experiment with making them. 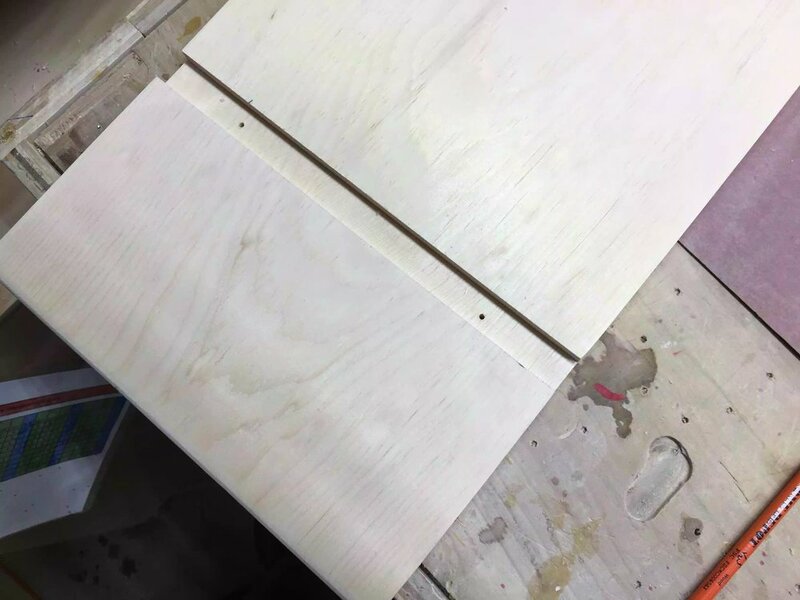 I started off my making a template so as that I cut rough cut them at the scroll saw and then use my router with my flush trim bit , below you can see some of the pictures. I haven't completed it yet but here are the steps in what I am making. 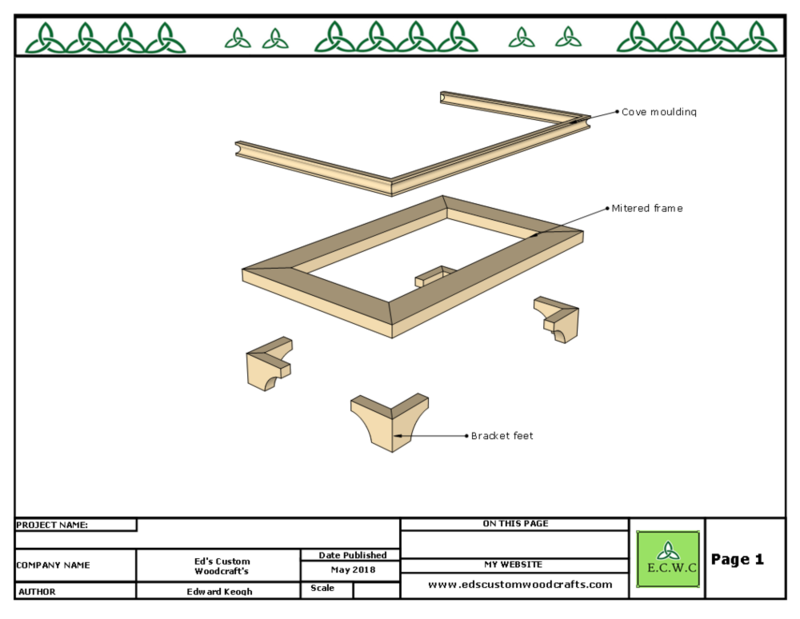 I value my 3D software programe called Sketchup as much as I value any tool in my shop, it really allows you the ability to play around with so many visual concepts to see if they work on a live project such as this one. I was really having a hard time trying to decide what style of bracket feet to make and also was unsure as to how they would be added to this specific project, to this end I love using Sketchup Pro. Here you can see the base in relation to the rest of the book stand, I really like how this looks as well as solving my rigidness headaches. So since I have my template I can start making the feet, these feet are not big there basically 2" wide x 3"long. I start my selecting the wood, I want the grain to wrap around the feet something I have been wanting to try and now is as good as time as any to practice this. I basically cut 4 strips out of the scrap pine board I had left over and I marked each board with numbers to keep them all matched until it was time to glue them up. I cut them on my crosscut sled on the table-saw, marked used double stick tape to stick my pattern on and took it to my router table where I installed a flush-trim bit in the router and trimmed them. I used my oscillating spindle sand to smooth all the milling marks and then proceeded to glue them up. I used a trick I saw on TV where a woodworker used painters tape as clamps, its always a challenge to glue up mitered joints and proved especially hard on small parts like these. I did think about using a splined miter joint but the parts were small cutting the groove for the spline would be difficult. Below you can see the pictures of this process. Using my template to gauge how much I would need and also determine where I needed to cut them apart and wrap the grain around both sides of the feet. I used my spindle sander to clean up the curved face. 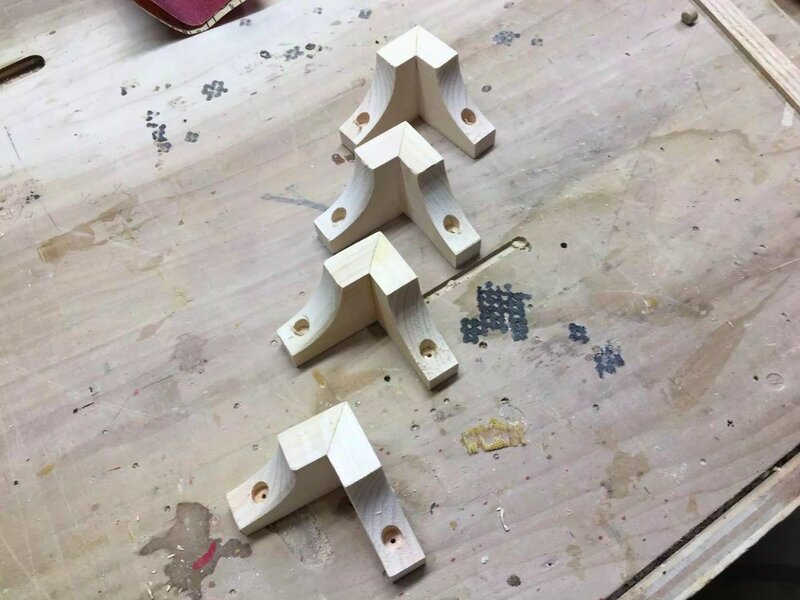 I laid out all the feet to keep them orgnised so I keep mating parts together for the next step which was cutting the 45 degree bevel to join both sides of the legs together without seeing the end grain of the wood. Its not a great picture but you can see the joint line closed up nicely , ill take the tape off tomorrow and sand it all nice and smooth. Below shows some pictures of this process. Here is what I was aiming for, and I will know tomorrow wether I was successful or not. This pictures shows the frame sitting on the legs, I haven't made the cover moulding yet but is for tomorrow. Next I will be finishing the bracket feet , securing the frame to the feet, making the cove molding for the front and the sides of the base, see you then. To be honest I didn't expect to get this much done today but sometimes you just hit a groove and bang out a lot of work, I basically expected to get the base, book barrier and some sanding completed but I got so much more completed. The top cross stretcher is very important because it attaches both sides of the back legs to each other, if you remember in Day 2 I am using a half-lap joinery because it gives me a lot more glue area I am also reinforcing the joint using solid oak dowels. So get the piece ready I clamped the cross stretcher in position with the legs and drilled a 3/8" hole using my drill bit , applied glue and hammered home the dowls. After the glue dried I cut the dowels flush to the surface and gave the piece a good standing. Almost finished, the dowles have been trimmed flush and the excess glue has been reoved, you can see the half-lap joint on the edge. Just need to clean up the joint a little. 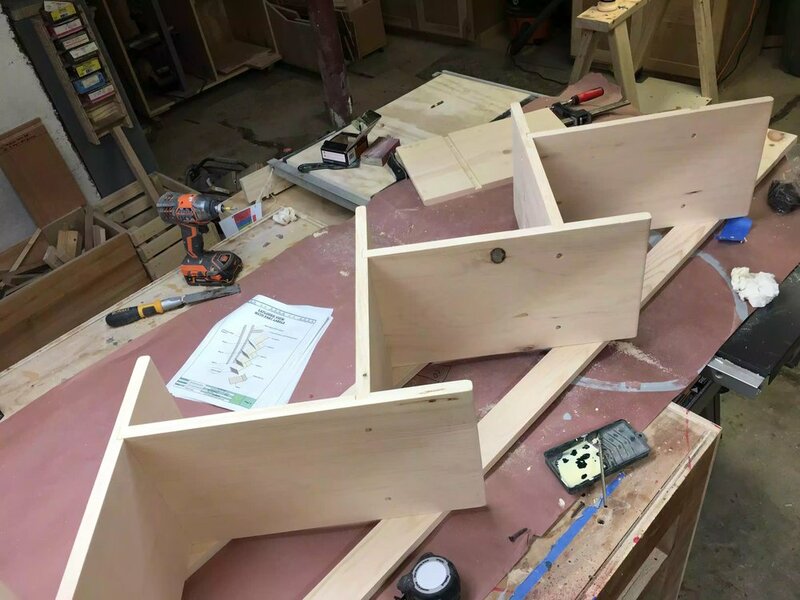 The shelves were already cut to final size and the dadoes were router into the top ends that would ultimately act as the joinery method doe all shelves to fit into each other. But today I needed to position the counter-sunk holes inside the dadoes so as that I could insert screws to act as clamps as the glue set on the shelves. I also decided to route a roundover profile on the ends of the shelves making them nice to the touch and not be sharp as this end would be interacted a lot with as that is where the books will be stored, I used my palm router to achieve this. The pictures below depict these steps . I made this little jig to position the holes in the same place because they would be seen I needed them all to be uniform. Its basically a stick the same size as the shelf dado with a whole placed on each end. Here is the jig in place. 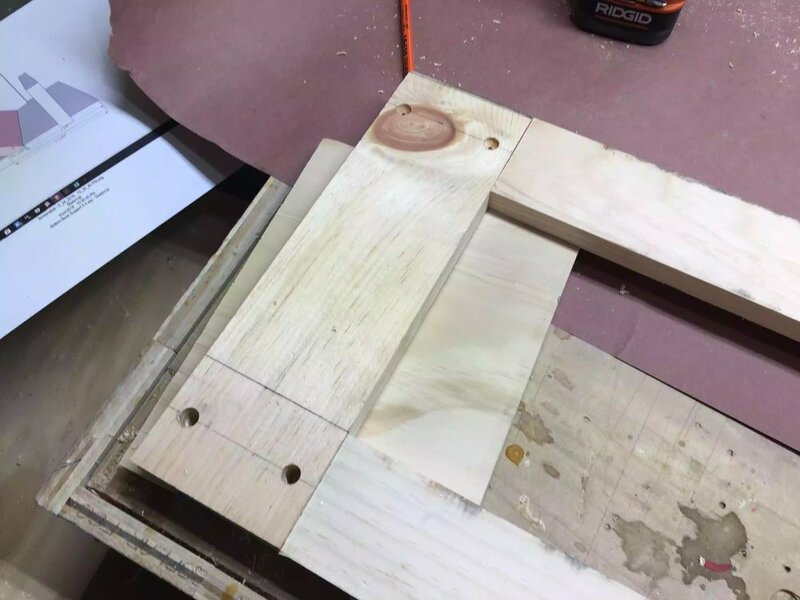 Here is the screw holes positioned, to make sure that countersinked holes were placed in the right position I drilled through holes from the inside of the dado and then flipped the board over and use my countsinking bit. In this picture you can see I just added the round-over profile to the shelf ends, I used my palm router to achieve this. I will sand all these parts down . When I designed the 3d model of the unit on Sketchup I troule shooted the design and I saw this as a possible problem, when you add books to the bottom shelf there is nothing preventing the books from sliding off since its not being contained by another shelf. So I added this detail in , I already added the dado to house this piece and all that was left was to mill it and I also added a round-over to the top. o attach it I used the same joinery , I added screws from the under side of the shelf and covered them with plugs. I also fpound a piece of solid oak in my scrap bin and decided to use that, I like how it came out and the oak provides a little contrast. In the picture above you can see the book end in position. 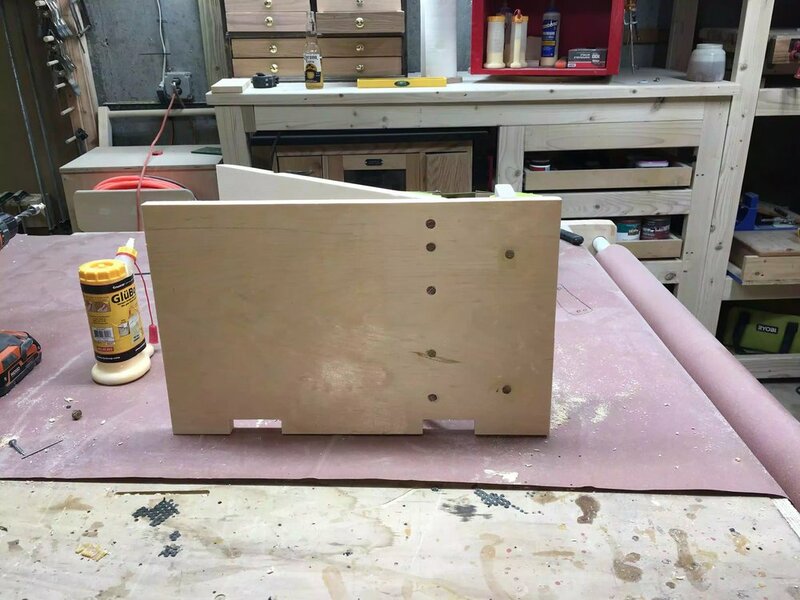 This is the base and the 2 holes on the right hand side are the screw holes keeping the book end in place. In the whole projhect this was the most nevrve racking so far because I needed to secure the shelf in the dado that I already cut buy using screws and dowels. 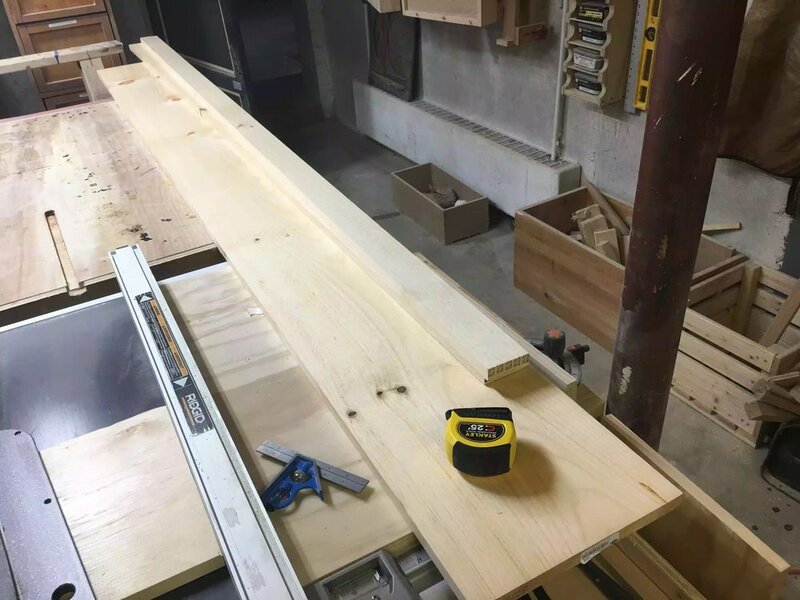 I started by line up the shelf into the dado and finding the thickest part of the 45 degree miter on the shelf I needed it to be thick because I was adding 1 1/4" screws through the base into the shelf and I didn't want to come through the visible face of the shelf. I also wanted to add 1" dowels through the base into the shelf to further secure it in place. To achieve this I used a 3/8" drill bit with a stop collar so as that I wouldn't bust through the face of the shelf and I think it worked out. I did a test on the strength of the joint by adding books onto the shelf and you can see that below. Bottom Shelf is in place and it didn't fall over, phew!!!! I decided that the best way to attach the shelves to each other was to build them lying the unit across my bench. All I needed to do was position one shelf inside the other and glue and screw all of them and coming back and adding the oak plugs into the holes that I made on Day 2. This step really didn't take long and within 20 minutes all the shelves were adjoined. I also fixed the back legs into the shelves using the dimensions I calculated on Sketchup and they were right on to within an 1/8"
This was extremely tricky and I took my time , when I made my plans I estimated the position of the screws that need needed to be insert from the back side of the legs and directly into the shelves, I could not get this wrong because I didn't want and screws visble on the outside andI also needed the shelves supported to he frame or it could tip. So I flipped the shelves over so as that the legs were on top and then I marked my dimensions at where the shelves intersected with the legs placed marks and drill pilot holes and then once I knew they were in the right position I counter-sinked them. So I am behind in blogging this projects progress so I am posting Day 1 & 2 in one post. I went to my Home Depot to get all the supplies needed for the Project, all I needed to get was the wood since I already had the screws and dowel plugs. (2) 1x3x8 Pine ( I really only wanted to get a piece of 1x6 but I didn't like the selection that was there. Since this project has only two board widths 11 1/4" (Which is what a 1"x12" actually is) and the other is 10 1/2” so I cut that to something size. The base pf the book stand has alot of going on , it has notches at the back of the board for the legs/ shelf supports to fit into so as that the legs will be flush to the base. 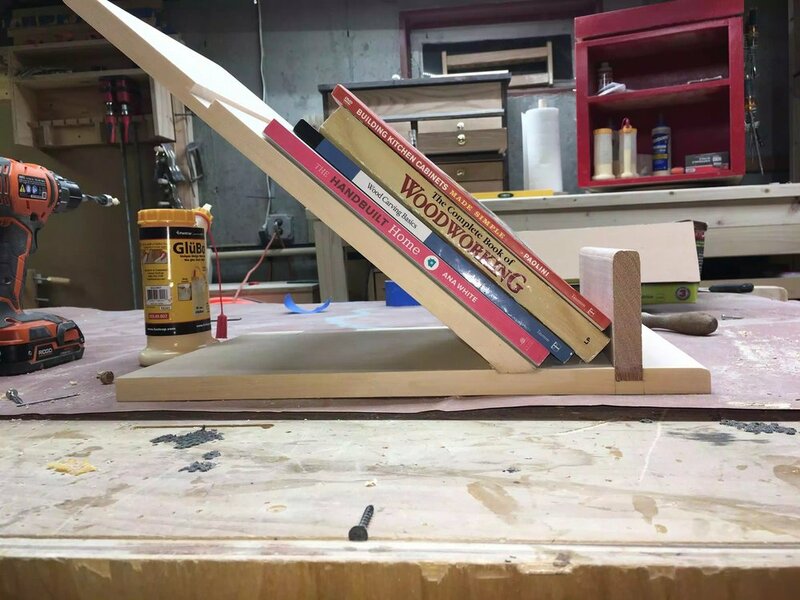 So I achieved this on my tablesaw using a dado stack, as you can see in the pictures below. In this picture you can see me cutting the back notches using my dado stack . You cant see it but I used my miter gauge to support this cut to minimize tear out. 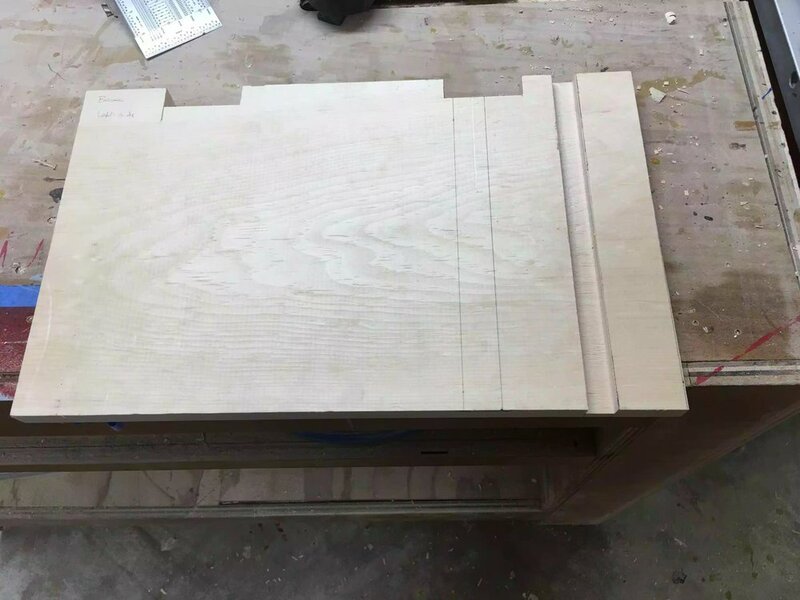 The bottom shelf is the only board that has 45 degree bevel cut , like all the other shelves it also has a dado positioned on one end to receive the next shelf. 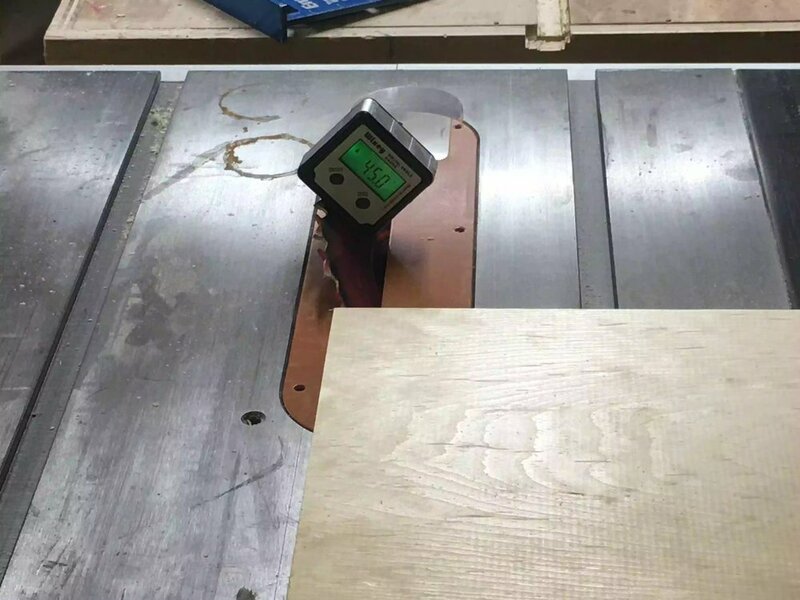 So below you can see me preparing the board to cut the bevel to it, using my trusty digital angle readout. 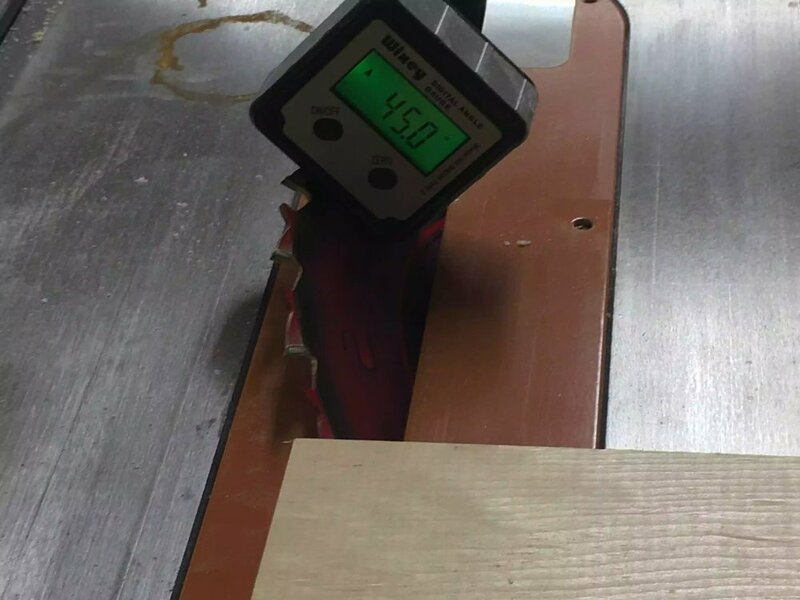 Using my digital angle reader to set my table saw blade at 45 degrees. At this point of the project I thought my base was more or less finished (I was wrong but didn't know it yet), since I already put the notches in the back of the base panel I cut the feet to length and I am using a half-lap joint to secure the top cross stretcher to the legs and since my dado stack was still in the table-saw I made the half-lap joints on both pieces. In the pictures below you can see the parts that have the half-lap cut into them. Once they were milled I did a test fit to make sure they were flush at the back. Although the legs look finished I still need to add 3/8" through holes so as that I can run my dowels through the 2 parts to add some strength, but that is for another day. You can see the legs fitting very well into the notches, and everything is nice and flush. I really like this joint because it allows a lot of glue to be used . I will be adding a dowel thought these parts later, but for right now they are not fixed in position. At this point I turn my attention to the shelves, all the shelves need at this point is to be cut to final size and I used my chop saw for that , I also need to add a dado into most of the shelves as that is how I join all the shelves together into 1 unit, I will also be adding countersunk holes where the dadoes will be cut so as that I can add screws to add more strength, when it come time for assembly the screws will also acts as clamps while the glue dries, I will also be adding dowel plugs to cover the holes, but all that is later. For today I just wanted to cut the dadoes in the shelves. To achieve this I used my dado stack in the table-saw to achieve this. Here you can see all the shelves (7 in total) and the bottom shelf in the back . All the dadoes are inserted. 1 Shelf is missing and that is the top shelf I am waiting to do that because I actually don't know what exact dimension it will be until all the other shelves are in place. As I mentioned earlier in the post I thought the base was all finished but when I tried to determine how I would actually keep the bottom shelf in place was very difficult because its been made with a 45 degree bevel and now I need it to sit flush on the base. 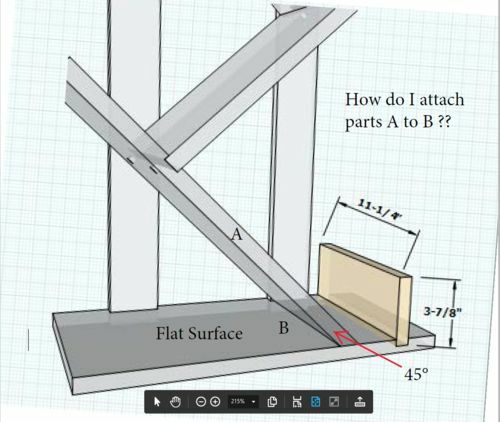 So I went to my Online workshop and solicited some help with this problem, I received quite a lot of ideas some included adding a biscuit joint, adding a angled dado for the bottom shelf to slide into, other options were to brad nail it into position while also adding glue, screwing up into the bottom shelf from the underside of the base. Here you see 2 options that were recommended the one on the right is the one I chose. Here you can see a 3D drawing that I did on Sketchup to show my problem. 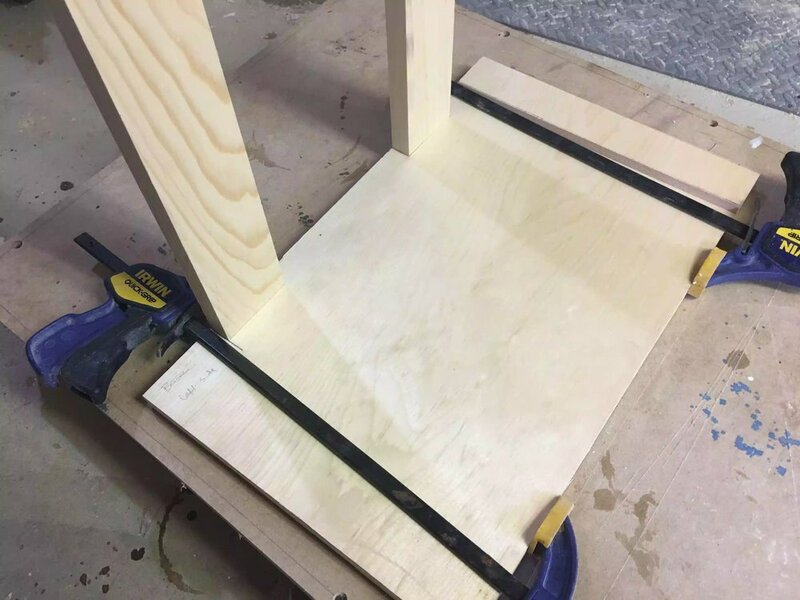 This is my spin on the option that was recomended, not only ill the groove be cut using a regular tabel-saw blade, I will also be adding dowels or screws from the under side of the base. Once I have this step completed I will post pictures. Here are the instructions someone went to the trouble of making me, with details like this I could achieve the solution. That is all I have completed in 2 days in the shop, next I will be working on adding the dowels into the cross stretcher in the top, sanding down all parts, I am also considering adding a round-over to all the shelf ends, using my router. So as of right now I am in the design phase of the project but I have made a 3D model utilizing Sketchup of what I think I want to make and its below. I hope to be making it either this week or next, but I will keep you posted.